I have been in the motor trade since 17 years old. 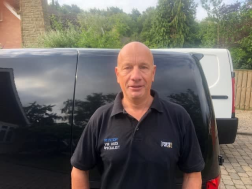 I ran our family garage Pitstop Ltd for 30 years in Newcastle until 2018 when I sold the garage and decided to take the business mobile. I now operate a fully mobile service for all makes/models & repairs and typically will take on any job no matter how big or small! Dave fitted new brake discs and pads to my car and a very reasonable cost. The car was picked up and returned to my place of work within 2 hours. Communication was very good and Dave was very polite and efficient throughout the whole process. David is knowledgeable, friendly and provides great communication. He provided an in depth report with pictures highlighting where there was cosmetic damage. His review of the mechanical side of the car was spot on as proven by the next MOT. He picked up the AC wasn't working which the seller fixed before I paid for the car. I bought the car without seeing it in person, based on David's report and telephone conversations. He provides a level of confidence which I would love to work with again. Perfect service, ordered a wing mirror replacement, he turned up on time and was done within 20 minutes. Excellent service by Dave. Brilliant communication before and after job. Knowledgeable and diagnosed them problem straight away. Happy customer. David was great...diagnosed problem quickly. Made arrangements to repair the car and kept me fully informed.